I discovered clay in August 2014 when I attended pottery classes at Studio Artemis with my kindergarten mothers group (a lovely, wild group of endlessly talented friends). We’d tried numerous other creative endeavours but none really resonated with me as clay did. 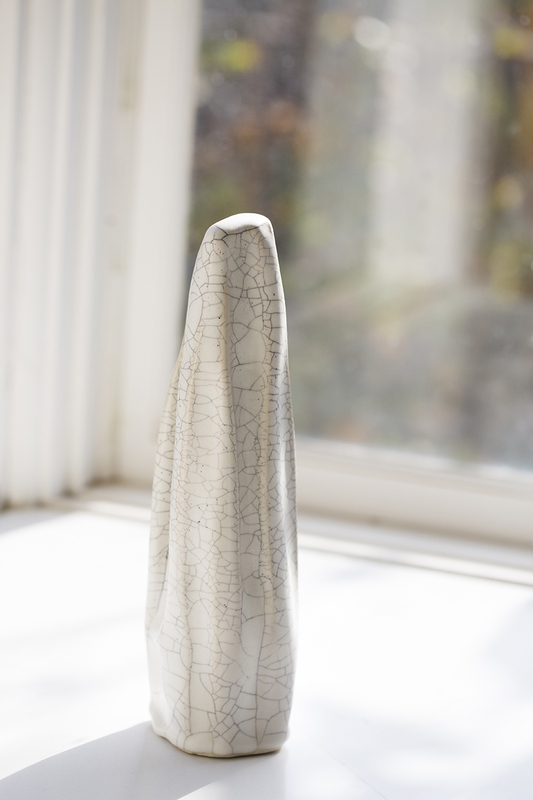 From the first time I touched clay I found a visceral connection. 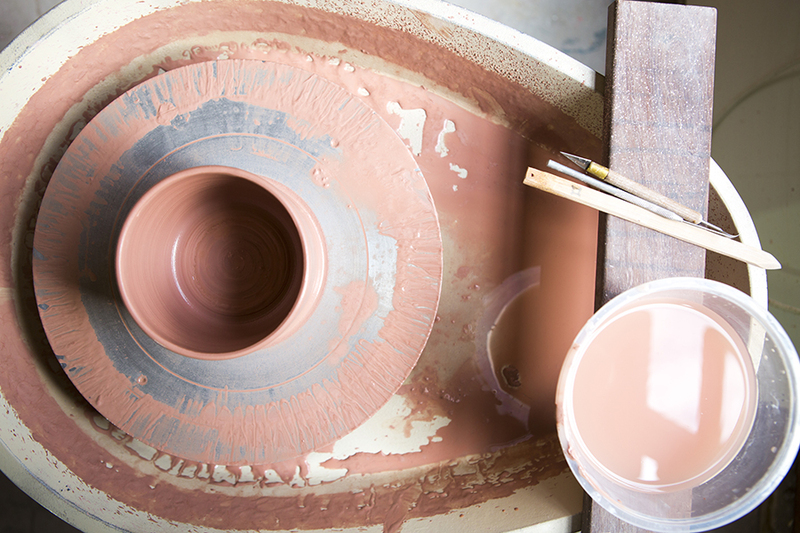 An internal dialogue occurred between myself and every touch of the clay. I still have that feeling whenever I touch clay and sometimes wish that I’d discovered this amazing material earlier (but with everything in life, it comes when you are ready). My clay journey actually began before I even really realised it, in a series of serendipitous moments which led me to Studio Artemis run by Kristin Miller in a very nurturing environment. I quickly acquired an insatiable appetite to know more. I spent a year experimenting and playing in my own studio producing oh so many mistakes, but always learning throughout this process. I luckily acquired my own little kiln which was invaluable during that year. This led me to take further intensive workshops, amongst which Master Potter Alistair Whyte was instrumental, along with Glenn England. This only increased my appetite to improve and learn even more, so I studied and completed my Diploma of Ceramics at Holmesglen which had amazing teachers. Who do you get inspiration from? People or Things? I am by nature a visual person and very good at observing the little things in life. The play of light on my window curtains, or the growing tendrils of the wisteria in my garden, will spark a hint of an idea for my ceramics. Years of playing with my home’s interior has also been an influence, and you will see themes I use in my home appear within my pottery. I design mostly for myself and what I would want to surround myself with and just hope that there are other like-minded people out there (as they say we all have a tribe out there). What is your favourite colour and textures to work with? I love clay as a material both in its raw state and after it’s been fired, and I dislike covering it completely with glaze. My natural tendencies are towards very neutral and earthy palettes. I pretty much live the aesthetic I’ve created in my home. Lots of natural materials playing off against each other with layers of the same colour in different textures; shiny against matte, rough against smooth. It all gives me immense pleasure. I find handmade pottery to be quite a tactile material, which needs to be held, touched and handled to be fully appreciated. For this reason, I’ve started selling my pottery at inner-suburban markets so people can really experience the look and feel of my work. Social media is very important and I enjoy posting images of my work on Instagram. I’ll normally pop a notification on Instagram the week preceding a market. We’ve recently linked our Facebook page to the Instagram posts too. We also have a website which currently sells our Jewellery range. Launching in early June 2017 we’ll also have our pottery available online at www.stateofpermanence.com.au. Our goal is to make beautiful, modern and original pieces at a price that is still reasonable, as I enjoy the idea of giving access to good design and functionality to everyone. Even though I appreciate art for art’s sake, for me the material I have chosen demands to be both functional as well as beautiful. 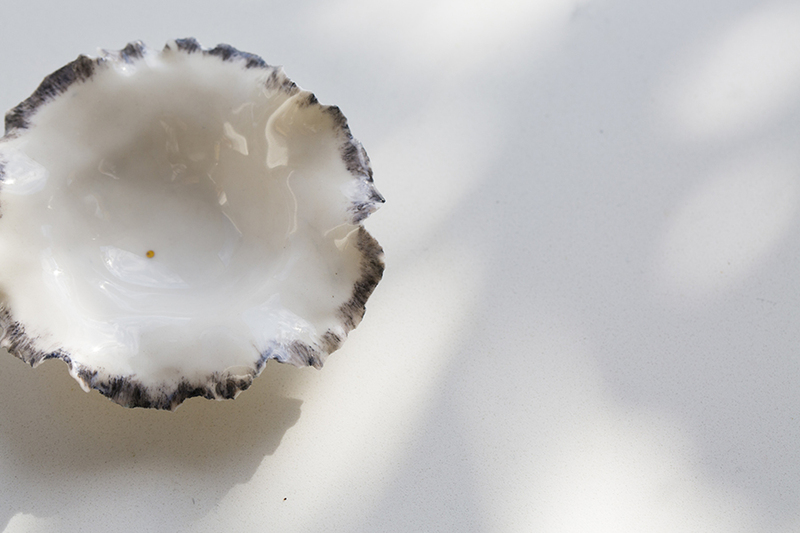 I find it quite difficult to create when the intention is purely for sculptural pieces. Saying this, I do have an exhibition coming up with all my fellow graduates from the Diploma of Ceramics. This will be held at the Malvern Arts Centre in Malvern, from the 7th- 16thJuly 2017. As long as I’m working with clay my methods vary depending on what I want to produce. I love all aspects of making whether it be hand building (which includes pinching), slab building, coiling or wheel throwing. As long as I can touch clay I’ll try it. I don’t tend to plan or design in any detail before making as I find this stifles my creativity. I will however sketch some ideas of particular inspirations in a visual diary that I keep. Currently it’s all about clay for me. The possibilities of this material are only hindered by your own imagination. It is essentially limitless as far as I am concerned. I often wish that everyone could experience the calming and grounding nature of this material. At the same time, it can be humbling and teach you some life lessons. For example, you will try to make and shape something as you picture it, but it doesn’t always turn out that way. You will learn from mistakes and unexpected results; you will feel loss and then learn to let go for the pieces that didn’t make it through the process; you will feel joy and pride in successes. Sometimes the clay won’t turn out anything like you thought, and you know what – that’s alright because sometimes it turns out better and you grow again in your art. As I love playing with textures, the potential of partnering this amazing material with other earthly materials peak my interest immensely. Watch this space as the ideas keep brewing constantly! Luckily, I’ve had access to a home studio from the beginning. It started with just a little space, but as the clay fever took over my studio has expanded substantially, with my ever patient husband adding shelves and necessities as required. The convenience of having it at home is immeasurable as I have three pre-teen kids that still need me around. I love the light in both my home and studio. It’s what initially attracted me to this house as it has huge windows, but is quite traditional with beautiful cornicing, original Tassie oak flooring and many other little details which would take too long to mention. To me it’s my sanctuary and where I share many lovely moments with my family and friends. Finally, and importantly, without the support of my hugely encouraging husband I would never be in this particular situation of working at something that I absolutely love. I am a lucky woman.